Apples have long been an important crop for Americans. The settlers brought apple trees from Europe and planted them in the colonies and western frontier. Apples were stored in cellars, dried, and made into apple butter and cider. They were an important source of food for early Americans. Many apple orchards in frontier America were planted by seed. This seed propagation led to a large number of distinct cultivars. Some reports list over 4,000 named cultivars in the United States in the mid-1800’s. Only about 10 to 20 cultivars are routinely planted today. Most apple trees purchased from nurseries are grafted onto a rootstock. The standard, or seedling, rootstock produces a tree that grows to 15 to 30 feet tall and can produce 30 bushels of fruit. This size tree requires most activities be conducted on a ladder, greatly increasing labor requirements. The standard tree is longlived and might be seen around old farms and barns. Dwarfing, or size-controlling, rootstocks are now commonly used on commercial apple trees. The advantages of dwarfing rootstocks are earlier fruit production and smaller trees compared to standard rootstocks. The table below compares apple rootstocks. Some of the dwarfing rootstocks have brittle roots, so the tree is not firmly anchored in the ground and needs support. In general, the more dwarfing the rootstock, the more support the tree needs in the orchard. As the table shows, there are advantages and disadvantages to the different rootstocks. Apple cultivars are referred to as spur type or nonspur type. Spur-type apples bloom on fruiting spurs and start fruit production earlier than nonspur types. Nonspur-type varieties bloom on flower buds at the shoot tips. Spur-type apple trees are typically 70 percent the size of nonspur-type trees. Apple trees are generally self-unfruitful (self-sterile) and require pollen from another apple cultivar for pollination and fruit set. Choose varieties based on bloom periods (early, mid-, or late season). It is important that the cultivars bloom at the same time to insure pollination. Apples are pollinated by insects, generally honey bees. Apples bloom later in the spring than pears, peaches, and plums do. That means the apple blooms and young fruit are less likely to be damaged by spring frosts and freezes. When choosing apple cultivars, consider chill hour requirements. In general, chill hours refer to the number of hours a plant is exposed to temperatures below 45 °F during the winter months. This exposure to cold temperatures is required for fruit trees to break dormancy. Average chilling hours during the winter for various Mississippi locations are these: Hattiesburg, 400 to 600; Jackson, 600 to 800; Mississippi State University, 800 to 1000; and Holly Springs, 1000 to 1200. If you plant an apple cultivar in Hattiesburg that requires 1000 chill hours to break dormancy, flower, and leaf normally, the apple tree will probably not grow very well since it will not receive sufficient chill hours. On the other hand, if you plant an apple cultivar that requires 500 chill hours in Holly Springs, it is very possible that the tree will meet its chill hour requirement by Christmas and start blooming in January. Blooming this early would expose the blooms to the next cold front, which could kill them. Smoothee, a recommended yellow delicious strain, can be used as a pollinator for most other recommended varieties. Smoothee may be the best golden delicious type available. The tree is vigorous, very productive, and easy to manage. The fruit excels in flavor, aroma, and long-term storability. Its russetresistant skin is glossy and smooth to the touch. Ripens in early September. The bloom period is mid- to late season (nonspur type). Good pollinator for most other varieties. Gala is a medium-sized apple, oval to round in shape and reddish orange in color. Recommended for fresh eating and cooking. Strong trees are compact growers and prolific bearers. Newer red sports, such as Royal or Imperial, are recommended. Ripens in late August. Bloom period is midseason (nonspur). Mollies Delicious is a late-summer apple. Like Gala, it has good quality. Susceptible to fire-blight. Ozark Gold is an outstanding yellow apple if allowed to ripen properly on the tree. This early golden delicious type ripens in mid-August. Bloom period is midseason (nonspur). Red Chief is a heavy producer and has all the spurtype tree advantages plus additional vigor, making it easy to establish and manage in the orchard. The fruit is high quality. Ripens in late August to early September. Midseason bloom (spur type). Arkansas Black is a compact spur mutation of an old variety. Popular for fresh market. An excellent pollinating variety for Red Delicious and other midand late-bloom season varieties. Ripens in mid- September to early October (spur type). Granny Smith is a very late-maturing, late-keeping, dual-purpose apple. Flesh is hard, crisp, and juicy, with excellent tart flavor. Fruit is grass green and shiny. A good companion cross-pollinator for Arkansas Black. Fuji is a very late maturing cultivar with excellent quality. Golden Dorsett is a yellow delicious type and is needed to pollinate Anna. Best southern variety. Nonspur, low chilling variety with early bloom period. Anna is a red apple recommended specifically for areas within 50 miles of the Gulf Coast. Anna needs Golden Dorsett as a pollinator. Nonspur, low chilling, and early bloomer. Ein Shiemer, an old standby, is a golden apple that self-pollinates. Nonspur and low chilling requirement. Fuji is not attractive, but it is probably one of the best quality apples on the market. The chilling requirement is low. Can be grown throughout Mississippi. Pears grow in most areas of Mississippi. In the southeastern United States, pears grow better if they have some resistance to diseases like fire blight and leaf spot. Most pear varieties are self-unfruitful (self-sterile). Plant at least two varieties with similar blooming periods (early, mid-, or late season) for cross-pollination. To avoid frost damage, plant low chill, early blooming pears only in extreme south Mississippi. Most pear fruit is better if picked before maturity and allowed to ripen off the tree at 70 °F. Kieffer is the most commonly grown pear in the South and is well adapted to Mississippi. This old variety has little resistance to fire blight. Considered an early to mid-bloomer. May suffer late-frost damage. The Kieffer pear matures in late September or October. Good for preserves. Orient produces large, somewhat round pears that ripen mid-August to early September. The tree is vigorous, spreading, shows some resistance to fire blight, and is well adapted throughout the state. Good for canning. The blooming period is mid- and late season. Moonglow is a spur-type tree that is vigorous, blooms late, and has good fire blight resistance. Fruit quality is good with a mild flavor, few grit cells, and soft flesh good for canning. Fruit ripens in mid-August. Ayers trees are vigorous, upright, and blight resistant. The chilling requirement is high. Ayers is recommended for north Mississippi only. The fruit is an attractive yellow with red blush and ripens in late July to early August. The blooming period is early. Baldwin is an excellent variety for Coastal areas because of its low chill hour requirement. The fruit is almost round and golden yellow when ripe. Bloom period is early. Ripens in mid-October. Maxine has less resistance to fireblight than does Magness or Moonglow. The trees are vigorous and upright. Maxine is a good pollinator for Moonglow or Magness. It ripens in mid-September between Orient and Kieffer. Fruit quality is good. Magness is high quality. Requires 5 to 6 years before fruit bearing begins. High resistance to fire blight. Ripens in late August. Magness does not produce good pollen. LeConte is adapted to North and mid-Mississippi. Good resistance to fire blight. Fruit is yellow with red blush. Excellent for eating. Apple and pear trees grow well in several soil types. A deep soil, ranging in texture from a sandy loam to a sandy clay loam, is best. They will not grow well in a soil that is poorly drained. Plant trees in an area that has full sun most of the day. Early morning sun dries dew from the leaves, which helps reduce diseases. Commercial orchards are routinely planted on hillsides with well-drained soils. Good air circulation helps prevent frost damage and control disease. For the best orchard performance, buy quality fruit trees from reputable nurseries. Inexpensive trees from discount sources often do not produce satisfactory results. A 1-year-old tree that is 3 to 5 feet tall and has a 3/8 to 1/2 inch diameter and a good root system will typically outperform a 2-year-old tree that is much larger at the time of purchase. Do not buy nursery trees with small or malformed root systems. Older nursery trees have branches that are too high to be used, and the trunk diameter is so large that it is difficult to break dormant buds at the best height for scaffold branches. If there aren’t enough healthy, wellformed branches in the desired area of the tree, you will need to cut the tree off 24 to 30 inches above the ground after planting. This cut will force new branches to grow, developing a well-shaped fruit tree. Fruit trees have traditionally been available as bare-root plants from nurseries. The trees are dug from field beds while dormant and held in cold storage until planting. Today containerized fruit trees are available, which can be planted after breaking dormancy. With proper care, either bare-root or containerized trees will perform well in the orchard. Planting in early spring is better than planting in the summer. Keep the roots of nursery trees moist before planting; allowing the roots to dry will kill the tree. If the tree cannot be planted immediately after purchase, store it in a cool place to maintain dormancy until planting. You can do this by “heeling in” the tree in moist, well-drained soil. The key is to keep the roots moist but not soaking in water. Prune damaged roots before planting. Apple and pear trees require an average of 15 to 20 feet on all sides to prevent overcrowding. A common spacing in commercial orchards is 20 feet between rows and 15 between trees. This spacing anticipates annual pruning to control tree size and spread. The planting depth of fruit trees is important. Trees will die or grow poorly if planted too deep. The correct planting depth for bare root trees is the depth at which they grew in the nursery. To find that depth, check for a change in bark color from the roots to the trunk. Containerized trees should also be planted at the proper depth. The uppermost root should be no more than 1 to 2 inches underground. Dig the planting hole three times as wide as the root ball and only deep enough so the roots will be at the desired depth. Spread the roots evenly around the planting hole. Make sure the roots have complete soil contact with no air pockets. Air pockets could cause roots to desiccate, or dry out. Use only the native soil as backfill in the planting hole; do not add amendments or fertilizer to the backfill. Apple and pear trees grown in most Mississippi soils benefit from annual fertilizer applications. Soil samples taken every two years will tell you which nutrients need to be applied. Many Mississippi soils are acidic and benefit from lime applications. Follow soil test recommendations and apply lime as needed to maintain a soil pH of 5.5 to 6.5. Balanced fertilizers such as 13-13-13 and 8-8-8 are often recommended for fertilizing fruit trees and do a very good job of supplying plant nutrients. However, phosphorus (P), the middle letter in NPK fertilizers, can build up to high levels in soils and may not need to be applied annually like nitrogen (N) and potassium (K). Too much soil P can be as harmful as too little. The soil test will provide this information. Nitrogen is often the limiting plant nutrient, and you usually need to apply it annually for optimum plant growth and fruit production. A shortage of N is indicated by short shoot growth (fewer than 8 inches per year), pale green or yellow foliage, and small, well-colored fruit. Too much N is indicated by excessive shoot growth (more than 30 inches), deep green foliage, and late maturing, poorly colored fruit. Excessive shoot growth shades fruitwood in the lower portion of the tree canopy and will eventually cause that portion to die. In time, the surviving fruitwood will only be in the upper reaches of the tree canopy and not distributed throughout the tree. Here are general guidelines to use for fertilizing apple and pear trees. Use soil test recommendations, personal observations of growth, appearance of fruit trees, and these recommendations as the basis for fertilizer applications. Excessive fertilization does not help the tree and is environmentally unsound and expensive. Apply a complete fertilizer (such as 13-13-13) in the early spring and a sidedress application in early June. The following guide will help. After apple and pear trees reach bearing age (over 4 to 5 years of age), apply fertilizer based on soil test recommendations. Usually 2 to 3 pounds of fertilizer per inch of diameter of the tree (measured just above the soil line) is enough. However, the best indication of the fertilizer needs of the tree is the terminal growth and the number and size of the leaves. Maintain an average of 15 to 18 inches of new growth per season. On nonbearing trees, apply fertilizer in a circle at least 1 foot from the trunk of the tree to just beyond the branch canopy. Take soil samples every 2 to 3 years. Apply limestone as indicated to maintain a pH of 6 to 6.5. Excessive N fertilization will lead to vigorous shoot growth. Shoots that grow quickly are more susceptible to fire blight in the early spring than those that grow slowly. Fire blight is one of the most common diseases for apples and pears and can kill entire trees with the right environmental conditions. Fruit trees with full crop loads need more fertilizer than those with no fruit. Mature trees that lose a crop may require no fertilizer that year to support adequate growth. Fruit trees respond well to irrigation in the absence of rain. Prolonged summer droughts reduce vegetative and fruit growth. In the absence of rain, irrigation during the early life of a fruit tree speeds the development of the tree and can bring the tree into bearing up to 2 years earlier than non-irrigated trees. During periods of drought, fruit will be larger if trees are irrigated. The irrigated bearing tree will also be in better condition in mid- to late summer to set fruit buds for the following year. In general, 1 inch of water per week is enough. Drip or trickle irrigation is ideal; the slow rate of application allows the water to soak deeply into the soil. This encourages deep root growth, which helps fruit trees to withstand the stresses of hot, dry summer weather better. Shaping the branch structure of fruit trees is much easier if you start the process soon after you plant the orchard. The goal of pruning apple and pear trees is to create a central leader tree with several whorls of scaffold branches growing from the trunk in tiers about every 24 to 30 inches. A central leader tree looks like the classic Christmas tree with a central trunk and side branches (called scaffold branches) growing at regular intervals from the trunk. The lower branches are longer and stronger than the branches higher on the trunk. Cut newly planted apple trees 30 inches above the ground. The vegetative buds close to the cut will break first. Select a vigorous, upright growing shoot to be the new central leader. This shoot should be near the top of the tree. Below the new leader, select four to six shoots to become the lowest set of scaffold branches. The best shoots for scaffold branches will come from the trunk at a wide angle rather than a sharp angle. Scaffold branches rising at a sharp angle from the trunk will break off of the trunk more easily than those at a flatter angle. These shoots should be equally spaced vertically (up and down the trunk) and horizontally (around the trunk). The lowest branches should be no lower than 20 inches above the ground. At the end of the first season of growth, reduce the number of lateral branches to 3 or 4, spaced about 6 inches apart vertically and distributed evenly around the tree trunk. Choose branches of equal vigor. It is best to have the scaffold branches growing at a 50 to 60° angle from the trunk of the tree. If the angle is less than 40°, the branch will be more vegetative than fruitful. If the branch grows at an angle more than 70° from the trunk, it may lack sufficient vigor to be a useful scaffold branch. Commercial apple growers often put spacers in the branch crotch or tie the branches to position them at a 50 to 60° angle during the first year or two of growth in the orchard. Branches growing at this angle will have side branches and come into bearing sooner than branches growing in a more upright angle. The best time to prune fruit trees is late winter and early spring before bud break. Do not prune in October, November, December, and January. First year dormant pruning – The goal after the first growing season is to insure that the central leader and the first set of scaffold branches are established. Do not allow the scaffolds to become stronger than the central leader. Head the scaffolds back, if needed, so they are shorter than the leader to prevent competition with the leader. Scaffold branches growing at the top of the tree will generally grow more vigorously than those at the bottom. That is why it is important to insure the first tier of scaffolds is strongly established before initiating the second tier of scaffolds. Prune the central leader 30 to 36 inches above the first scaffolds. This is where the new central leader and the next tier of scaffolds will arise in the second growing season. If the tree did not grow well the first growing season or did not produce satisfactory scaffolds, prune the tree in the same way as at planting and start over again. This will delay fruit production but over a lifespan of 25 years will produce a stronger, more productive tree. Second and third years – Repeat the process of scaffold selection and central leader renewal until the tree reaches the desired height. A 12-foot tall tree will usually have 3 or 4 sets of scaffolds. Do not allow the bottom scaffolds to be overshadowed by the upper scaffolds. The lower scaffolds should be the longest, most vigorous scaffold branches. The uppermost scaffolds will be the shortest and least vigorous. In the dormant pruning after the second and third seasons of growth, continue to train the scaffold branches so they grow at a 50 to 60° angle. Do not allow the scaffolds to grow flatter than this, or vegetative growth will slow or cease and reduce the production of the tree. Strong sprouts that are growing straight up should be removed. This is the time to build the framework of the tree for the future. The scaffold branches will support the foliage and fruit in future years. Arrange the scaffold branches so that sunlight can penetrate the tree canopy to maintain fruitwood throughout the canopy, rather than only at the top. Mature tree pruning – After the primary scaffolds and main framework of the tree are established, the goal of annual dormant pruning is to maintain an optimum amount of fruiting wood distributed evenly through the tree canopy. The fruit buds of apple and pear trees are formed on spurs or branch tips, depending on the cultivar. Fruiting spurs will be productive for many years if they get enough sunlight during the growing season. A balance between enough sunlight on the fruit spurs and enough shade to protect maturing fruit from late summer sunburn is desirable. Scaffold branches at the top of the tree should have relatively weak vigor compared to lower scaffolds. Do not allow the upper scaffolds to shade the lower scaffolds. If necessary, remove vigorous upper scaffolds and replace with weaker branches. Remove vigorous sprouts arising in the canopy that could disrupt the central leader/scaffold structure. Remove any sprouts below the bud union; these are the rootstock and probably will not produce desirable fruit. Trees with heavy fruit set must have a portion of the fruit removed to produce fruit of adequate size and quality. Excessive fruit loads can break limbs. With good pollination and environmental conditions, each fruiting spur can produce three to six fruit. Leave only one fruit per spur. Space these 6 to 8 inches apart on the fruiting branches. To prevent damage to fruit spurs, remove unwanted fruit by cutting with pruning shears. Thin as soon as it is evident which fruit will develop. The time to start thinning is when fruit is 3/8 to 5/8 inch in diameter. Generally, fruit in the top of the tree canopy will grow larger than fruit in the bottom of the canopy, so fruit lower in the canopy should be spaced further apart than those in the top. Too much fruit on a tree will cause small fruit, broken branches, and a reduced crop the following year. Generally, success of the orchard depends largely on the care and attention given the trees throughout their lifetime. Maintain a rigid spray schedule for insect and disease control. The main diseases that attack apples and pears in Mississippi are fire blight, cedar apple rust, and bitter rot. General information regarding apple and pear diseases and pests can be found in MSU-ES Publication 736, Homeowner Apple and Pear Insect and Disease Control. 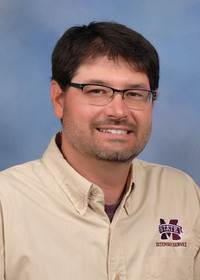 By Dr. John Braswell, Extension Professor, Coastal Research and Extension Center; and Dr. R. Crofton Sloan, Assistant Research Professor, North Mississippi Research and Extension Center.